So I completely forgot that yesterday was the 25th! I still haven’t sewn since we moved, though I’ve got some projects that absolutely have to be finished soon! But I got this done a few weeks ago and have been saving it. 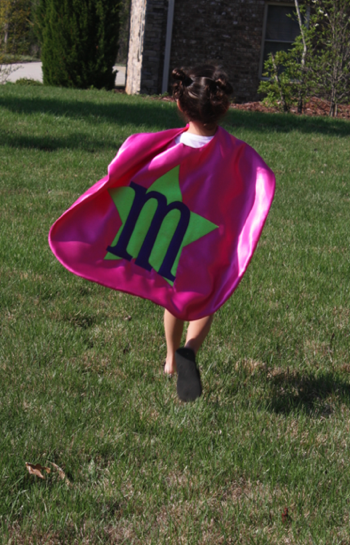 I know some kids who LOVE superheroes and a cape is such and easy way to add that perfect extra touch. I wanted to keep the logo simple, just a star and an initial to personalize them for each kiddo. 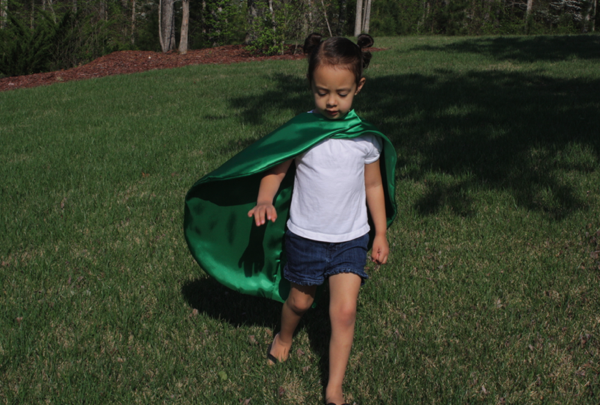 The capes have a simple velcro closure for easy on and off. I made the head hole large enough so that Sofie can get them off and on without opening the velcro! 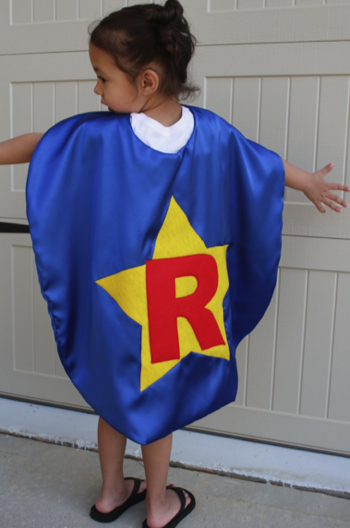 Even easier for a DIY costume piece. After making these and tucking them away until Christmas, Sofie decided she needs one of her own. I haven’t had a chance to make it for her yet, but she hasn’t let me forget about it! They were pretty quick and easy to make. First I took some scrap fabric and cut my pattern piece. 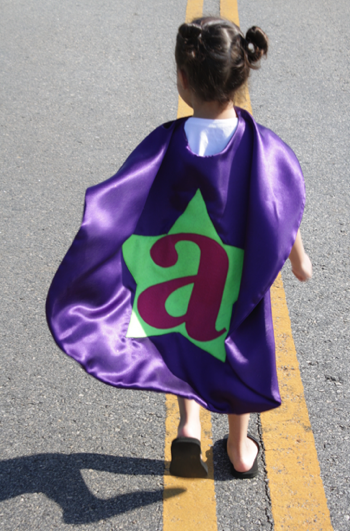 Capes look like a large bib so it was pretty easy to draw. 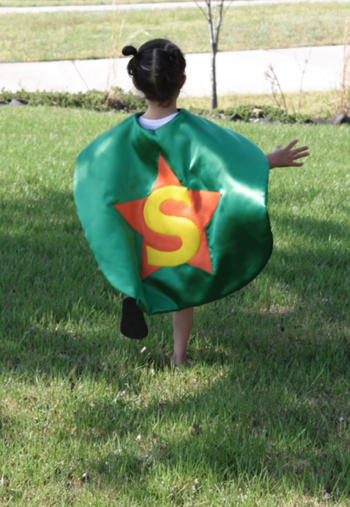 I kept trying it on Sofie until I got the right size and shape I was going for. I was planning on sharing my pattern piece, but since I have no idea where my scanner is in this sea of boxes, it’ll have to wait. **A note on fabric: I got my fabrics from JoAnn’s and Hobby Lobby. 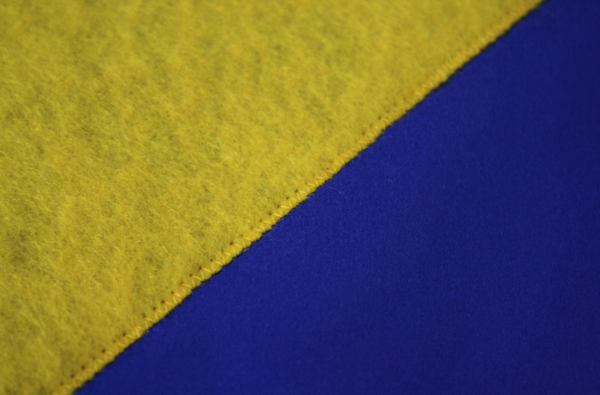 At JoAnn’s I got costume satins because they were the most economical for the project. I was able to cut the main outer piece all in one, but the piece on the inside had to be pieced together. The fabric I got from Hobby Lobby was the same approximate price (since both stores have frequent sales and offer coupons) but the fabric was easier to work with, didn’t fray as much, and was wider so I was able to cut 2 whole pieces. 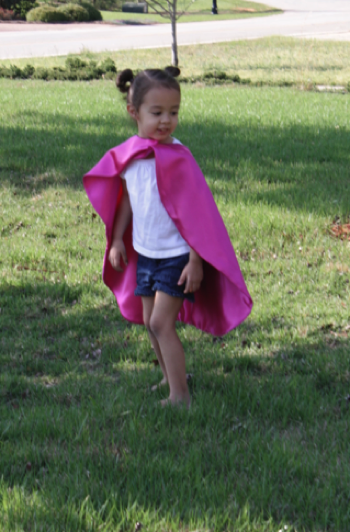 The cape I made in the tutorial was the fabric from Hobby Lobby. So to begin I took my pattern and cut 2 pieces from my fabric. 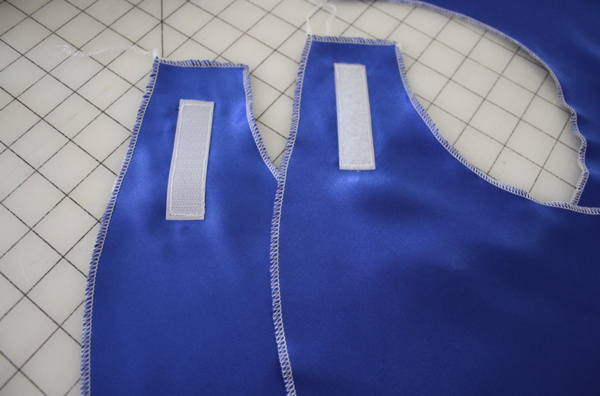 I serged around both pieces to prevent fraying while I was working with the fabric. This isn’t necessary so if you don’t have a serger, don’t feel like the project isn’t possibly for you! 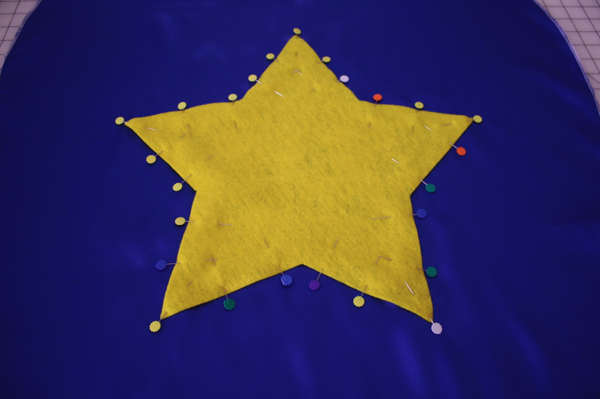 Then I cut a star from felt, using a shape I found on Google. 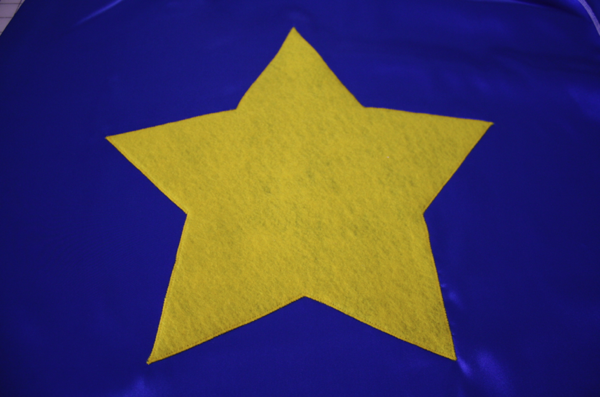 I pinned the star in the middle of the outer cape piece (no measuring, just eyeballing) and appliqued it on. For more information on applique see my applique tutorial and tutorial on appliqueing curves. 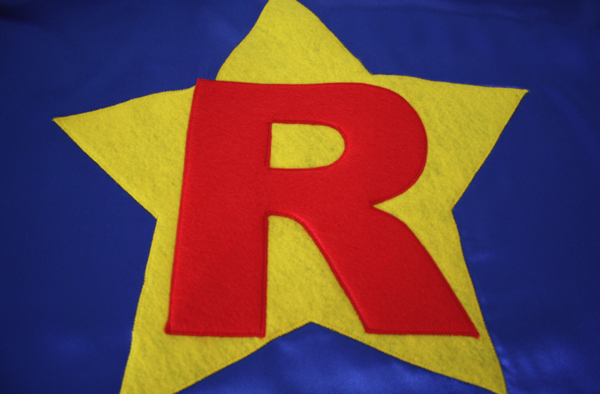 Using the same method, I appliqued the letter on top of the star. For the “A” and “M” I used Pharmacy font from dafont.com. 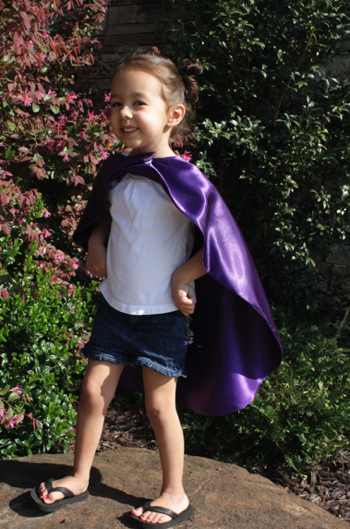 Then cut a few inches of velcro and sew them to the cape pieces. The easiest way to make sure you’ll sew them on right is to place both pieces right side up and put them on the same side. That way when you have wrong sides together they’re on opposite sides and will be correct for closing. My card ate the rest of the pictures for the tutorial but the last steps are very easy. 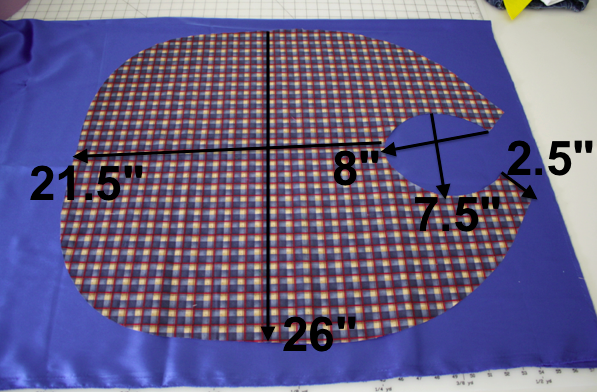 Place right sides together and pin around the perimeter to hold the fabric in place. 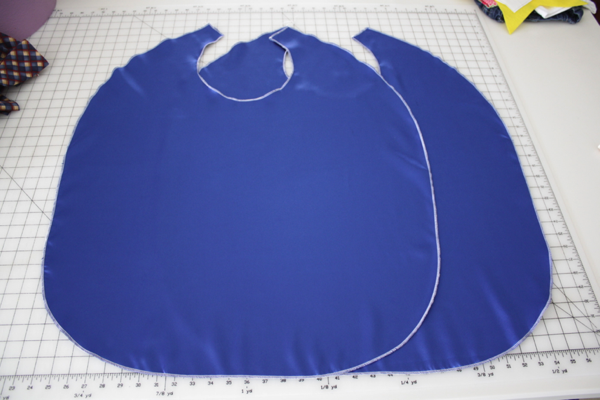 Sew around the outer edge of the cape and leave a hole a few inches wide to turn through. Then using matching thread, sew the hole closed. That’s it! 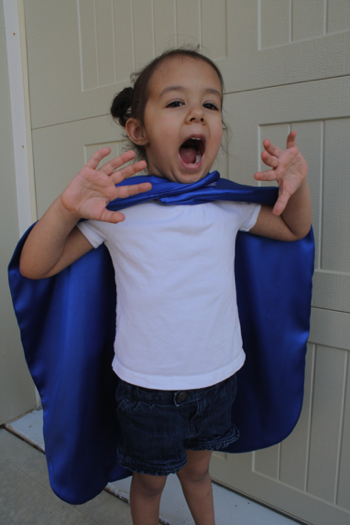 Now you’re ready to help someone special help save the world! Adorable!! I’m working on rag quilts. I made this set for a baby shower this summer, but am doing other ones for Christmas presents once school gets out. could you please give me the dimensions of the cape. I’m making several for my grandaughter’s 4th b-day. She looks to be the same size as Sophie. Hi Mary! I updated the photo with the measurements.